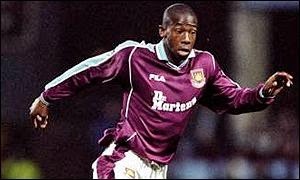 Verywestham: Sam: Campbell Can Be Our New Wanchope! Will he score or fall over the ball? As England lick their wounds after losing to Italy in a tight encounter where both sides went toe to toe for a full 90 minutes, breaking news from sources close to Upton Park has revealed how Costa Rican star Joel Campbell has been given the thumbs up for a move to West Ham. Sam Windybottom, a long time Hammers fan from Plaistow revealed, "that Joel Campbell kid really reminded of Hammers favourite Paulo Wanhope - pacey, cheeky, unpredictable and with a wicked shot on him"
Wanchope, who is currently assistant coach to the Costa Rican national side, is remembered for his sunny disposition - something that is even more evident than usual today after his sides stunning victory over Uruguay last night. For his part, Campbell not only scored, but also terrified the Uruguayans with a series of audacious long range strikes that whistled past the upright with the Uruguayan keeper stranded. Windybottom further interjected "After a couple of season's of being punked around by Arsenal, it's time for that Campbell lad to find a proper team - and in my view that should be West Ham"
On the down side, ex-Hammer Pablo Armero was displaced from the top of the bodacious World Cup goal celebrations chart by Campbells 'bun in the oven' offering. Of course.. Arsenal signed him as an 18 year old from the Costa Rican league, was forced to loan him out three years running for work permit issues and when Campbell is about to be granted a work permit and become an established player it "should be West Ham" to profit from all that.. How did you work this out? Why wasn't that West Ham who "punked him around" for 3 years in the first place? Don't all the gooners exit when they become successful? He's Wanchoppian alright but not workmanlike enough for BFS. We're more likely to get one of those Uruguayan ghouls.